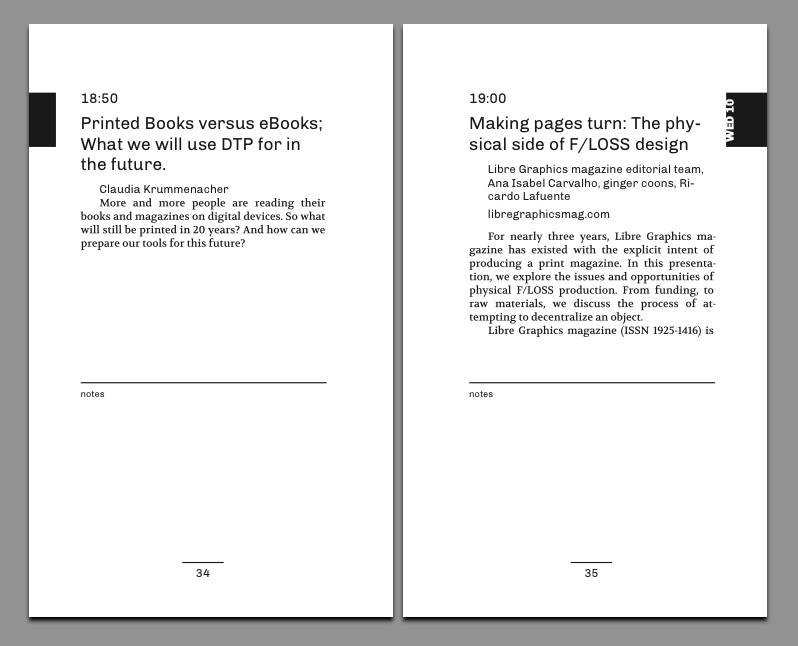 A few days ago, the Libre Graphics Meeting 2013 (which will take place in Madrid during April 10-13, and where I will present the Libre Type Specimens project) has published the schedule of talks and workshops. 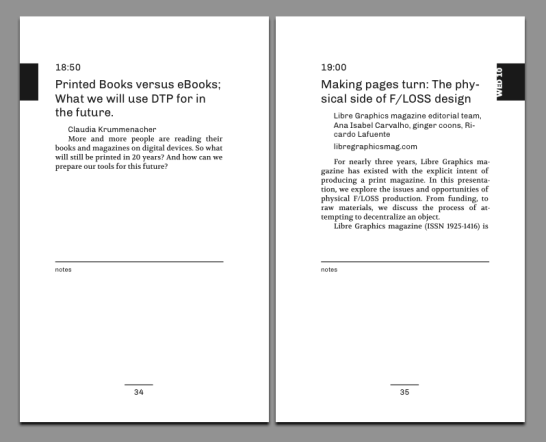 For anyone interested in the future of graphic software – be it typography, design, interaction, video – this is huge. I have the feeling that those four days will be incredible, a temporary autonomous zone where the brightest minds of the open graphics movement share their visions at the speed of thought. 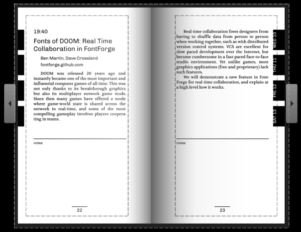 It would allow me to be better prepared, by reading the conference abstracts during my travel. Being more aware of who will be talking and what will be presented, I will have better interactions with the participants. A pocket book is simply a great format! It encourages reading, it facilitates writing, it’s easy to feel attached to it. There will be a whole lot of libre font designers present at the conference (Vernon Adams, Alexei Vanyashin, Dave Crossland, OSP…) so it’s a great occasion of putting their fonts to good use. 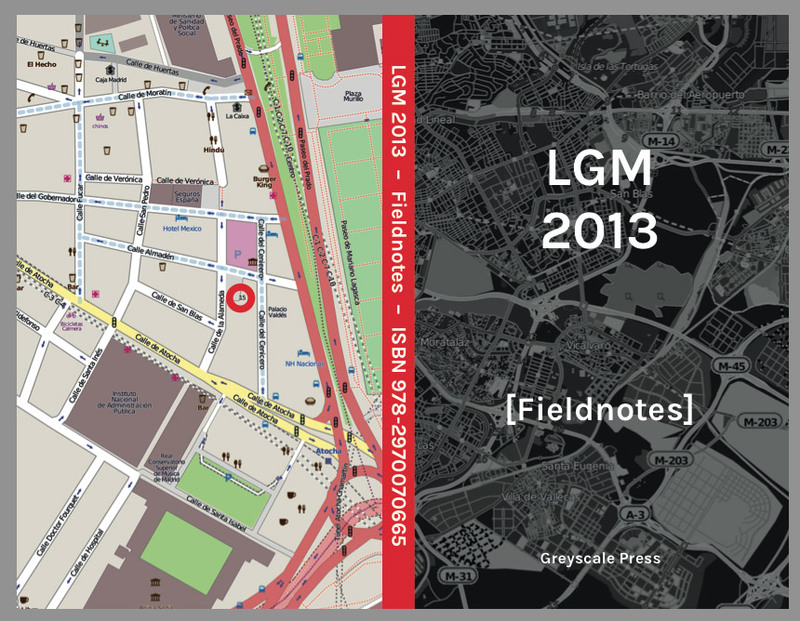 So that’s how the LGM 2013 Fieldnotes book was born. On that rainy Sunday afternoon of March 17th, I entered in “speedproject” mode, and 24 hours later, the book has been entirely layouted and uploaded to Amazon’s servers, waiting to be approved by the CreateSpace staff. Update: and 24 hours later, it has been approved. Hooray! 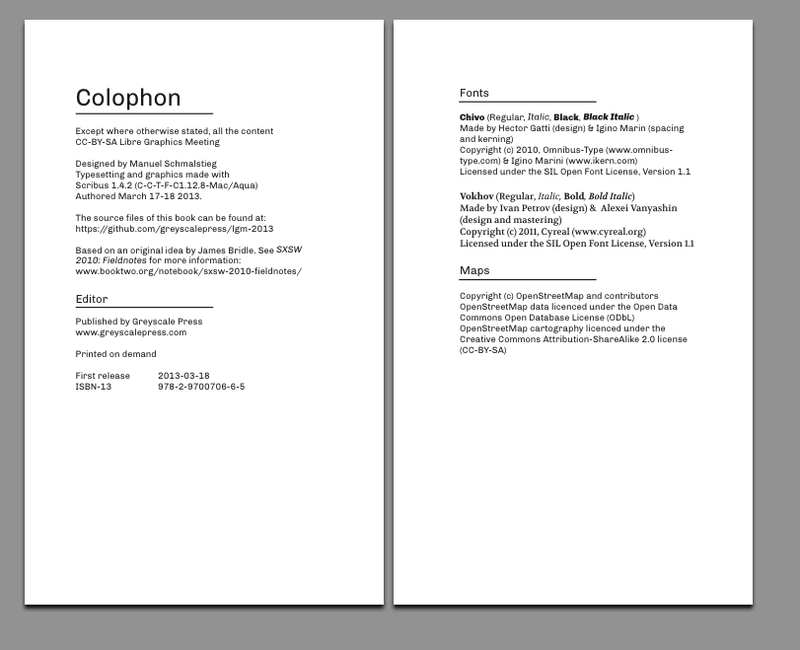 From the first drafts, I uploaded PDFs to Amazon in order to test the way margins and bleeds are handled. 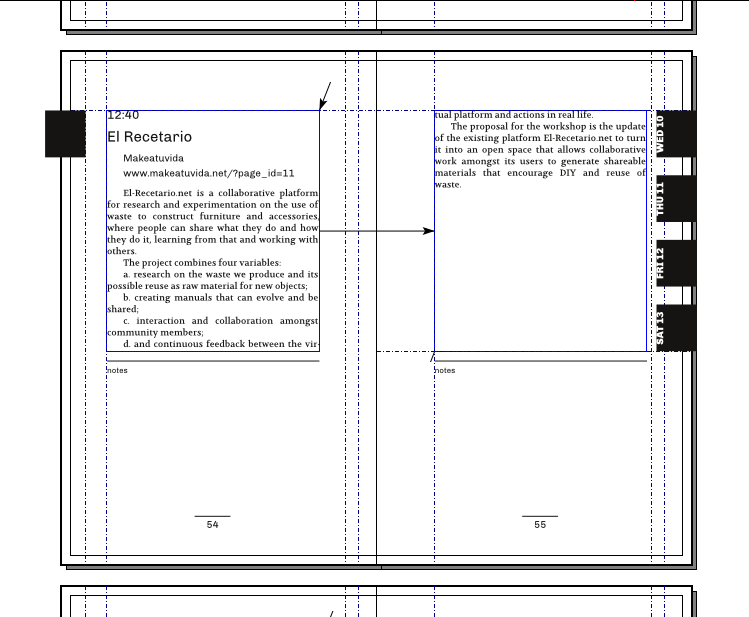 And I finally figured out one mysterious quirk: in the Scribus Document Settings, it’s mandatory to set the Interior Bleed to zero, while having Top, Bottom and Outside at the generic 0.125 inch. 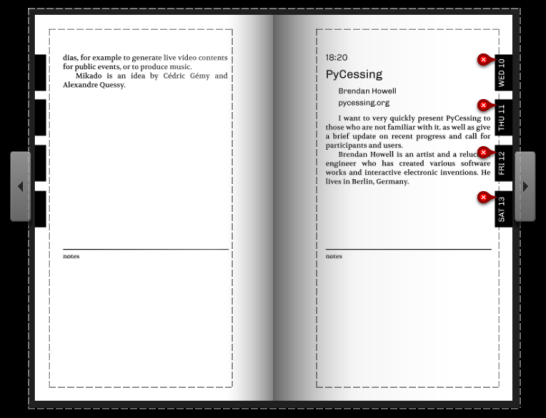 Otherwise, the interior bleed gets added to the document width, which shifts the margins of the right page by the same amount. For the main body text, I selected a libre font made by one of the conference attendees: Volkhov, by Ivan Petrov & Alexei Vanyashin of Cyreal. I used Chivo (by Omnibus Type) as the sans serif counterpart – it’s becoming one of my favorite neo-grotesque fonts, alongside Karla (which I used for the cover). This book is supposed to serve as a notebook, during the conference, therefore it has generous empty zones for taking notes. See, it’s a book and a pocket computer at the same time. And it needs no power plugs! I was reminded, once again, that paragraph styles of LibreOffice files are lost when importing into Scribus 1.4.x, but that styles from a HTML file are retained. I figured out the best way to make a paragraph style search/replace in Scribus: don’t use the GUI, just run a GREP (regular expressions search) on your document source file! Scribus files aren’t binary, they are XML files, and therefore it’s pretty simple to apply powerful search/replace operations with your favorite code editor. 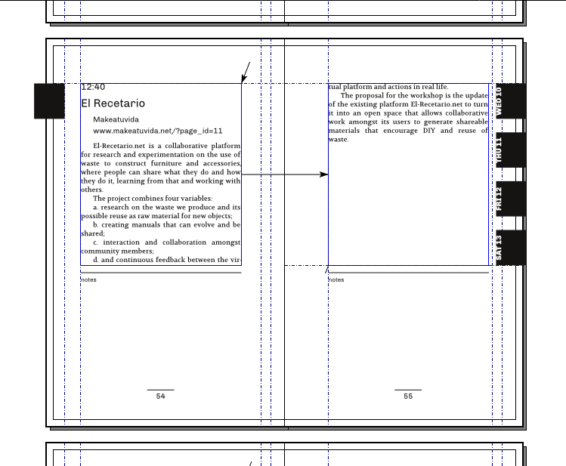 That was very satisfying, finally I found a great workaround for what was my biggest gripe with Scribus. Now we only need to wait another 24 hours until the files get approved 5 to 7 business days for it to show up on Amazon, and hope that the printed items will be delivered quickly. The list price should be 4.85 USD, or 4.44 EUR. If you want to see the original pdf, go to the GitHub project repository, and look into the /print/ subfolder. And see you at LGM, hopefully! Update (03/18, 22:00): it’s already available on the Amazon.COM, Amazon UK and Amazon DE sites. Update (03/20, 20:00): and now at Amazon.ES and Amazon.FR also. Update (03/22, 23:00): after locating a few typos in the font credits, and improving some spacings, I uploaded an improved interior file. Lesson learned: Amazon now needs 24 hours to re-validate that file… and during that time, the book is unavailable for ordering. :-( Good to know that for the future. In the dashboard, I see that 25 items have been sold (12 by myself). This post is part 5/10 of the #back2blog series. Yes, exactly. Actually, quite a bunch of low-end books are being printed by Amazon’s secret warehouse. 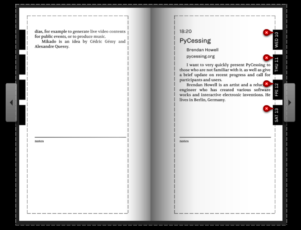 And yes, they acquired CreateSpace some time ago, which is quite similar to Lulu and Blurb. Compared to Lulu, their validator is more picky (makes harder to publish experimental graphic works), and a human agent has to approve each book – a countermeasure to fight the “spam in book form” epidemic. The massive benefit compared to Lulu & co is that people can order from Amazon, and get cheap or even free delivery.